According to data from a 2012 FBI crime report, one in every thirty-six U.S. homes will be broken into this year. This results in an average loss of about $2,230 per break-in, totaling in an annual loss of about $4.7 billion dollars. Nationwide, you’re looking at a burglary occurs about every 15 seconds. Yikes. Sure, it’s a shame that people can’t be trusted, but these scary statistics are all the more reason to upgrade your home’s security and focus on properly locking up your home. While simply locking your doors and windows and doing nothing else is probably enough to keep burglars at bay for most people, there are plenty of reasons to install a new door lock or seek out a high-security lock installation in the Naples area. Whether you have commercial locksmith needs or you run your business from home and need a safe locksmith that you can trust, Sure-Lock Locksmith is the lock and key expert for you. Here are some simple but useful home security tips to help keep intruders out of your home. It’s not uncommon for motivated burglars to break in via your windows once they’ve discovered that your doors are locked. If shatterproof glass isn’t in the budget, try installing a simple security film that makes it more difficult to get inside. Speaking of glass, make sure that you’re reinforcing your sliding glass door. These doors have very flimsy, weak locks and cannot be trusted on their own. Get a strong piece of wood or a security bar that wedges in between the door and the wall. This will make it virtually impossible to get inside without breaking the glass. If you don’t have motion-sensitive lights installed on the outside of your home, you should at least consider it. Thieves and wrongdoers hate attention, and they’re more likely to scram when your outdoor lights illuminate them in the dark. Your neighbors are a valuable asset. They can collect your mail and newspaper while you’re gone, or safely stow away any packages delivered to your doorstep. Just make sure that you trust them, of course, because they’ll be handling your things when you’re out of town. Thieves are also known to target items like barbecue grills, lawn mowers, bikes, ski equipment, and other outdoor gear that may be sitting outside your garage or shed. Do yourself a favor and keep a watchful eye over these things, or lock them in a high-security shed when you’re not using them. Having a package sit outside your porch all day while you’re at work is pretty much asking to have it get stolen. If possible, opt for a signature-required delivery. 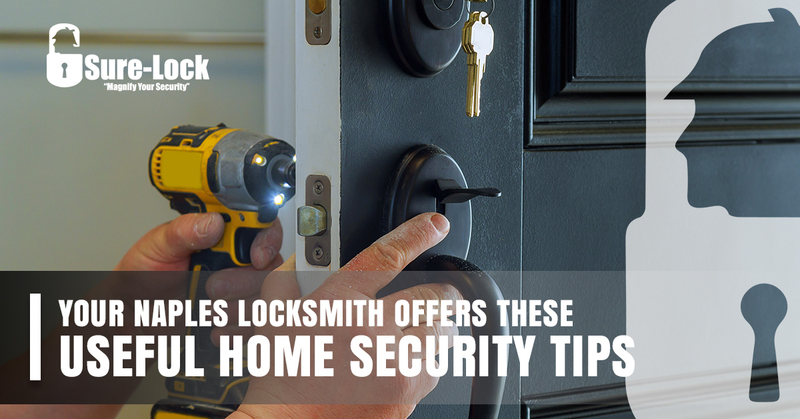 If you need help upgrading your business’ or home’s security, Sure-Lock Locksmith is on the job. Contact us today for a free security survey.